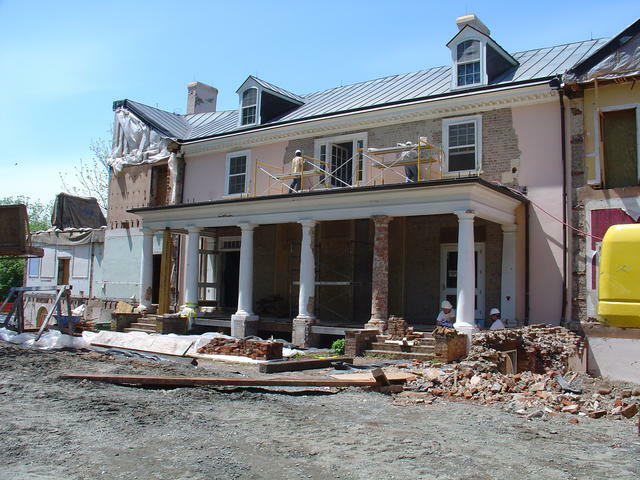 When the Restoration started, the rear colonnade’s columns were covered in a thick, ca. 1901 cement-based stucco. Because the stucco was made from cement, it was trapping moisture in the columns’ brick core and causing it to deteriorate. Since the modern stucco was damaging the column, it was removed. However, before it could be replaced, an investigation into any surviving evidence of the Madison-era finish had to be made. Fortunately, once the modern render was removed it appeared that traces of an earlier finish survived. The challenge, however, would be to determine what the finish was made of and if it dated to President Madison’s time. Restoration masons removing the ca. 1901 stucco from the Colonnade columns.